The first thing you need to understand about Lil Tay is that she never wanted you to feel sorry for her. "B**** if you're trying to mess with us, I'm gonna s*** on your mumma!" Lil Tay, nine, screamed at the camera. 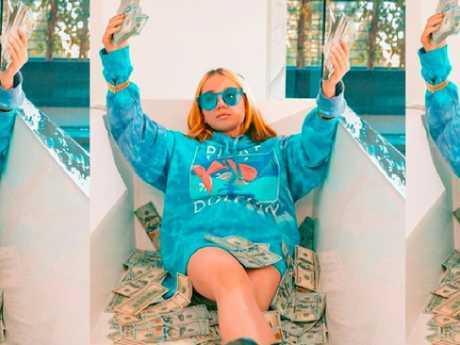 It was a standard video for the flexer and rapper, who over the past year gathered herself more than two million followers on Instagram. Screaming swear words into a camera phone, telling you she was a millionaire superstar rapper - watching Tay was a deeply unsettling experience. She was so little, and so aggressive. Just a little baby kid that wanted to shame you for being poor and "f*** you up". 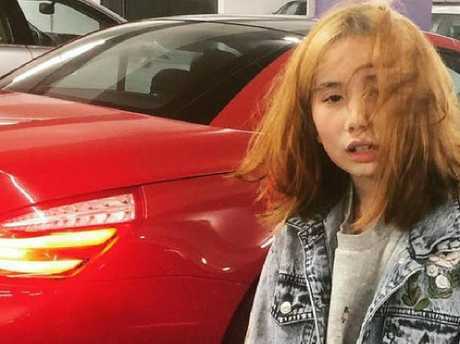 "Lil Tay just copped a brand new Bentley truck," said Lil Tay back when she was flexing. "See my outfit? Everything I wear be designer. See my chain? This chain cost more than your rent!" Tay's flexing was very adorable, but honestly a bit frightening. Cop a video of hers and you'll understand what I mean. She's teeny tiny and definitely couldn't, you know, boil her own egg, but she talks a big game - she's into cars, houses, luxury things. She likes making fun of people who are poor. She also uses the N word. As her popularity grew, so did her infamy. People were dumbfounded, asking over and over again: "Where are your parents?" "If other people are hurt, then that's their own problem," her mother said recently, when asked about Tay's crude language. "I know my kid." Lil Tay got a big jump on her notoriety by feuding with another baby rapper called Bhad Bhabie, who you may actually have heard of. Bhabie, real name Danielle Bregoli, once appeared on Doctor Phil as a delinquent teenager, where she talked about stealing cars and referred to the audience as a "bunch of hoes". She implored them to, "cash me outside, how 'bout dat'?" in Floridian street vernacular, and the phrase and video quickly went viral. But while Tay flexed, Bregoli/Bhad Bhabie became a proper musician. She recently wrapped up a tour of Australia. Lil Tay's fame was enormous, however, and she amassed 2.3 million followers on Instagram. She'd talk a big game and run around fancy cars, jumping in and out and on the hood, suggesting various vehicles belonged to her and that she could drive. She'd hold thick wads of US dollars like a phone. She'd pose like a gangster in front of display homes with other teens and adults. It's called a "flex", like flexing your muscles; it's a move of aggression, to show others you are tough, wealthy, an alpha. And it was Lil Tay's calling card. Lil Tay's claims were multifarious and ranged in their truthfulness. She said she was "youngest flexer in the century!" That was probably true. But she also claimed to be buying and driving $US200,000 sports cars around Beverly Hills (all right kid). 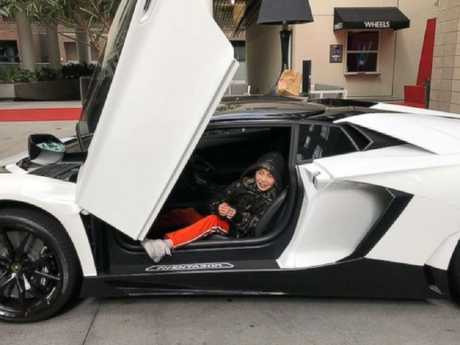 Lil Tay in a sports car with "butterfly" wings. She also claimed that when she lived in Atlanta she "was broke as hell", but then she "woke up one day" and decided to get rich and started "moving bricks". Generally while she made these claims in her videos, she was throwing money in the air and scattering it on the ground. It's a flex, for sure. In May of this year, reports surfaced that Lil Tay's mother, Angela Tian, a real estate agent, had been fired for using company homes and cars to help her nine year old daughter film her videos. Tian's boss claims his former employee used his luxury vehicles and real estate listings and used them to her own end for video shoots. He claims her forced her to resign but she disputes this, saying she quit of her own accord. Reports have surfaced that Lil Tay is being coached and held hostage. In June, Lil Tay emptied out her Instagram account and left a single story with the words, "Help me". People started expressing concern for Tay and claimed that she was being coached. In an interview on Good Morning America, Tay's mother Tian makes clear that she believes in her daughter's ability to "be a superstar". The interviewer also asked Tay's brother Jason if he was coaching his nine year old sister on how to behave, a question that seems particularly pertinent when videos surface of Tay smoking from a hookah, or using racial epithets. Disturbing vision of Lil Tay smoking a hookah. Jason's response was indirect. He said "a lot of people are going to say this and that, we just keep going". During the interview, Tay seemed to find it extremely difficult to concentrate, her eyes darting around. Kind of like a regular nine year old who is disinterested in steering a large social media career. She told the interviewer she doesn't use swear words in real life. 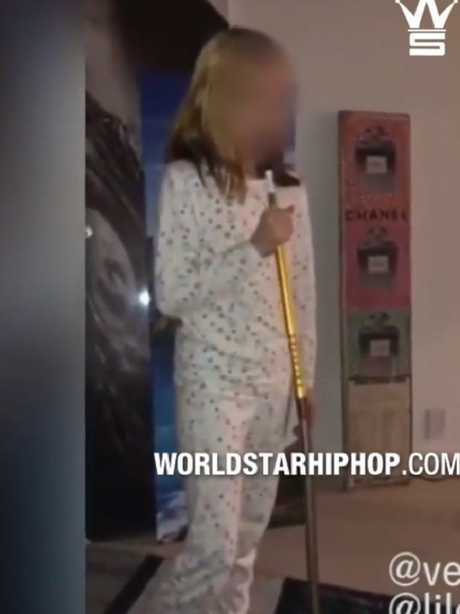 But despite the family's claims that her swearing, aggression and flexing are totally "organic" kid behaviour, a video that surfaced earlier shows Lil Tay learning lines and being coached by somebody. The first thing you need to know about the now 10-year-old "millionaire rapper" Lil Tay is that while she might embody some weird, warped version of the American dream, she is actually only pretending to be American. "I worked hard, so if y'all work hard, y'all can accomplish your dreams, just like I did!" she screamed in one video, after explaining that her toilet cost more than most people's rent, and her bed cost the same as "a lambo". Tay's mother is a Chinese national who emigrated to Vancouver and her father is a Canadian lawyer named Christopher Hope. And Hope has had enough of the shenanigans. He said when he found out abut the videos: "I was really unhappy that she had dropped out of school to participate in inappropriate activities that I thought could negatively affect her future and her present." Lil Tay's Instagram account was deleted in June, and The Daily Beast started reporting on a battle between Tay's parents. Lil Tay explains it all with her mother on Good Morning America. Tay's parents now seem to be deadlocked in a custody battle over their daughter. Tay's mother has alleged Hope didn't pay child support and was abusive. Hope has alleged he has full custody and that Tian illegally took their daughter to the US. Tay's manager, Harry Tsang, said that Tay's dad basically wanted the videos of Tay to stop being posted online and for a quarter of her earnings to go "to a trust fund dedicated to Tay". The current situation for Tay is that her management structure is freewheeling and her career is in free fall. She has been unable to monetise her massive following in the same way her nemesis Bhad Bhabie, who now sits in the mainstream, did. In her most recent interview, Lil Tay declined to answer all the questions she was asked. When the interviewer offered to schedule a call when she wasn't being monitored by her mother, Tay said: "Right now I'm in a bad situation and I don't want to talk about these things."